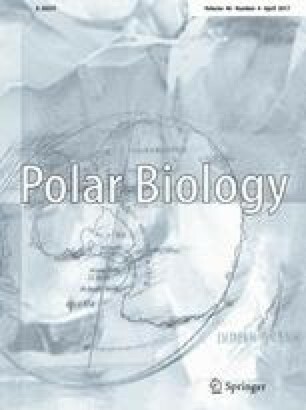 Temporal variation in isotopic composition of Pygoscelis penguins at Ardley Island, Antarctic: Are foraging habits impacted by environmental change? Several studies have suggested that penguins are undergoing a major restructuring of their feeding habits and distribution after drastic climatic changes in the Antarctic Peninsula region. With the objective of estimating potential medium-term and inter-annual variations in trophic niche, we measured δ 15N and δ 13C in feather samples of pygoscelid penguins from museum specimens (1982–1984) and in blood and feather samples from 2009/10–2011 collected from animals on Ardley Island. Current penguin feathers had lower δ 13C and δ 15N values and were more similar to Antarctic krill values, than feathers in 1982–1984 and blood from 2009/10-2011. Moreover, δ 13C and δ 15N values from museum feathers and modern samples occupied a larger isotopic space in Gentoo Penguins (Pygoscelis papua), compared to Adélie Penguins (Pygoscelis adeliae) and Chinstrap Penguins (Pygoscelis antarctica). Our results from feathers samples indicated that penguins have decreased their consumption of fish and other prey of higher trophic levels in the early interbreeding period (EIBP), while increasing the amount of euphausiids (Antarctic krill Euphausia superba) taken. The isotopic values of the species suggest that foraging sites varied significantly over time and seasonally. We suggest that environmental changes may have modified the feeding habits of pygoscelid penguins, resulting in changed foraging behaviour in the EIBP, and altering the secondary prey consumption. Prey choice in breeding pygoscelid species is probably limited by the foraging range around the breeding colony and competitive exclusion between congeners. We are very grateful to the following organizations and persons: Instituto Antártico Chileno, Museo Nacional de Historia Natural de Chile and Juan C. Torres for logistical, fieldwork and collection support. Special thanks to Gabriele Schafheitle, Ina Hampel and staff of Ecophysiology Lab, Universidad de Chile for help in analysis, and to the Life Science Mass Spectrometry Facility at SUERC. We thank FONDECYT grant No. 1120276 to PS. PQ was supported by a grant of the DFG, Germany.